Cattleya amethystoglossa is in bloom now in the nursery. 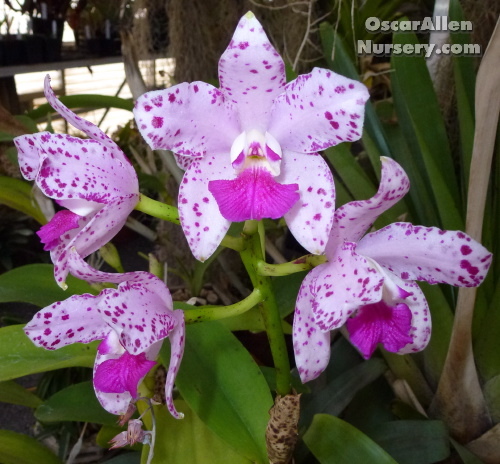 This Brazilian native is a tall-growing member of the bifoliate Cattleya group of orchids. The orchids pictured here have an average height of 18-24 inches, and they are growing taller each year! I can expect these orchids to achieve a final height of between 4 and 5 feet tall by the end of the next two growing seasons. The clusters of 5-14 fragrant, 2-3 inch flowers are a happy and welcome break in the sometimes dark, cold mid winter season. Yes, I have some of this plant in the store: Cattleya amethystoglossa. We are not able to have visitor to the Nursery at this time. We will have a display and sale table at the Oregon Orchid Society show in Portland on April 14 and 15. I will post pictures on the site of changes in the Nursery as new plants and hybrids grow and flower. I will also post pictures from the Oregon Orchid Society Show, so keep an “eye out” for updates! Do you have any available for sale? Please state size and shipping costs to area code 33035 (Florida). I have Cattleya amethystoglossa in 2.25 inch pots at $20.00 each. Shipping is via FedEx and the cost depends on the speed of service. Please see the website and feel free to use the shopping bag to get an idea of the total cost and delivery options. Thanks for your interest!